Collections by trusted partners and YouTube Kids: Starting this week, our partners and the YouTube Kids team will offer collections of trusted channels on a variety of subjects, from arts & crafts and music to sports, learning, and so much more. This makes it easy for parents to select only the channel collections and topics they want their kids to access. Just go into Profile Settings, and select from available collections such as Sesame Workshop. 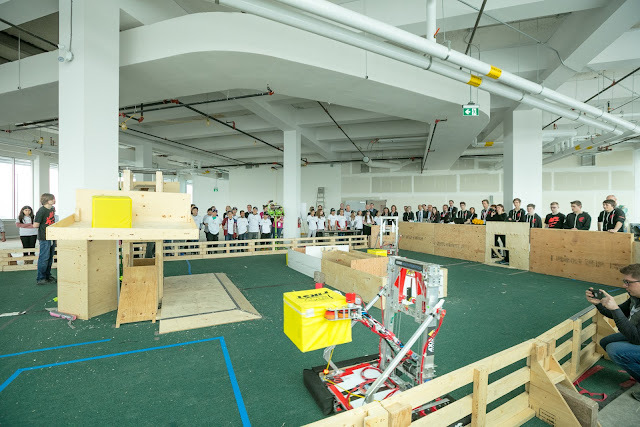 We will continue to add more partners over time. Parent approved content: Parents know better than anyone what they want their children to watch. 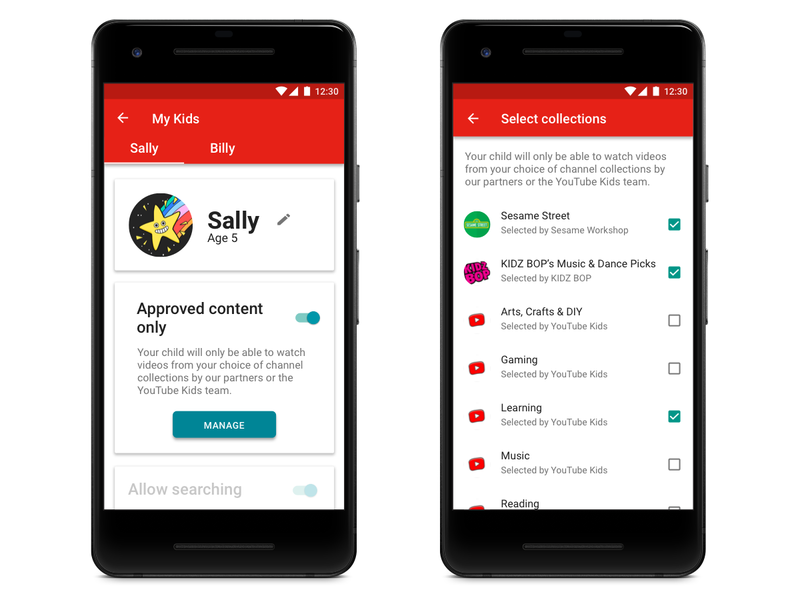 For those parents who want even more control over the videos and channels in the YouTube Kids app, we're rolling out a feature later this year that will allow parents to specifically handpick every video and channel available to their child in the app. 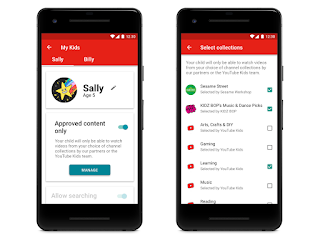 Improved search-off control for an even more contained experience: Parents have always been able to turn search off within the YouTube Kids app, but starting this week, turning search off will limit the YouTube Kids experience to channels that have been verified by the YouTube Kids team. This means that search off will not include recommendations from the broader YouTube Kids corpus. For parents who like the current version of YouTube Kids and want a wider selection of content, it's still available. While no system is perfect, we continue to fine-tune, rigorously test and improve our filters for this more open version of our app. And, as always, we encourage parents to block and flag videos for review that they don't think should be in the YouTube Kids app. This makes YouTube Kids better for everyone. 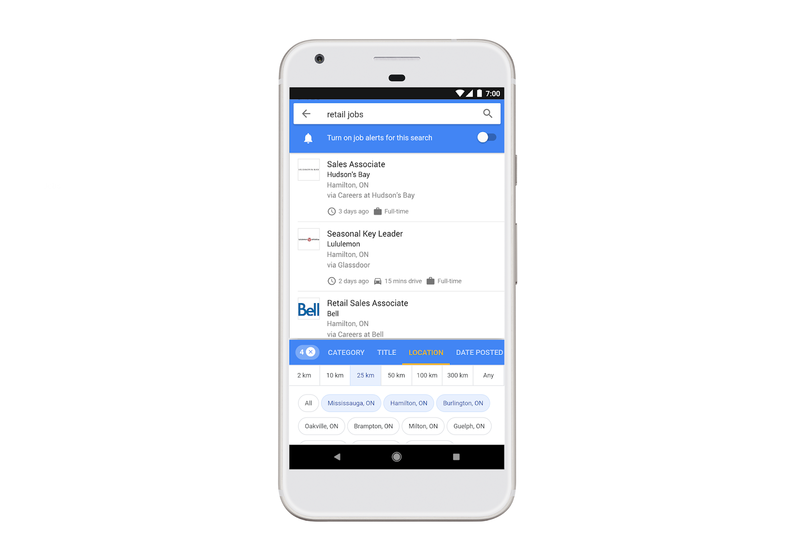 To trigger the job search feature, enter queries on Google search with the word jobs, such as “jobs near me,“ "summer jobs,” “government jobs,” “work from home jobs,” or “jobs in Canada.” You’ll see in-depth results of job postings from across the web in one place, on Android, iOS, and desktop. Geography is an important consideration in finding a job. The “location” filter shows a range of distances, from 2 km to 300 km away from your location. You can also view jobs “anywhere” if you don’t have a location preference. And if you’re signed in, you can even see how long it will take you to commute for some job postings. Searching for a job can take time, and keeping up with new job postings can be challenging. Now, if you step away from your job search, you can pick up right where you left off by “saving” job postings. 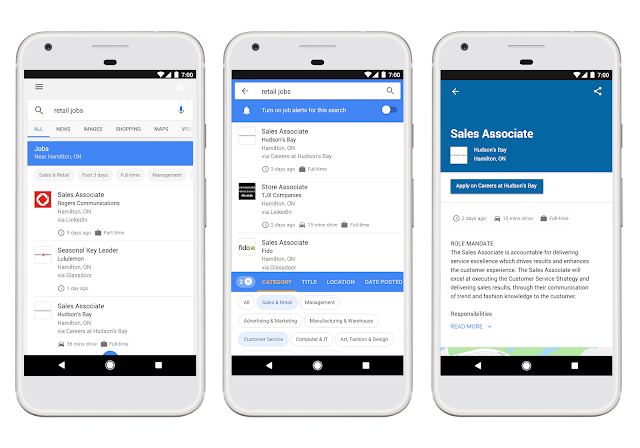 You can also turn on alerts for your search to receive email notifications when new jobs are posted that match your criteria, keeping you up-to-date and on top of your job hunt. The feature connects people to job opportunities by putting the convenience and power of Search into the hands of job seekers from Victoria to St. John’s. No matter who you are or what kind of job you want, you can find job postings that match your needs. We introduced this feature in the US last June, and since then, we’ve seen 60 percent more employers showing jobs in Search and connected tens of millions of people to new job opportunities. We’re working with a number of organizations from across the industry to bring you the most comprehensive listing of jobs—including the Canadian government’s Job Bank/Guichet-Emplois, BCJobs.ca, LinkedIn, Glassdoor, Monster.ca, Jobillico, Jobboom, and other Canadian providers. You’ll see job postings from these sites and others across the web all in one place, as soon as they’re posted. To ensure that even more jobs are listed over time, we’re publishing open documentation for all jobs providers, from third-party platforms or direct employers, detailing how to make their job openings discoverable in this new feature. Whether you’re looking for your first job, better pay or work closer to home, we hope this new feature on Google will help make your job search simpler and more effective. Finding a job can be difficult, whether you’re a student looking for part-time work, an electrician seeking a job closer to home, or a teacher moving to another province to be close to family. 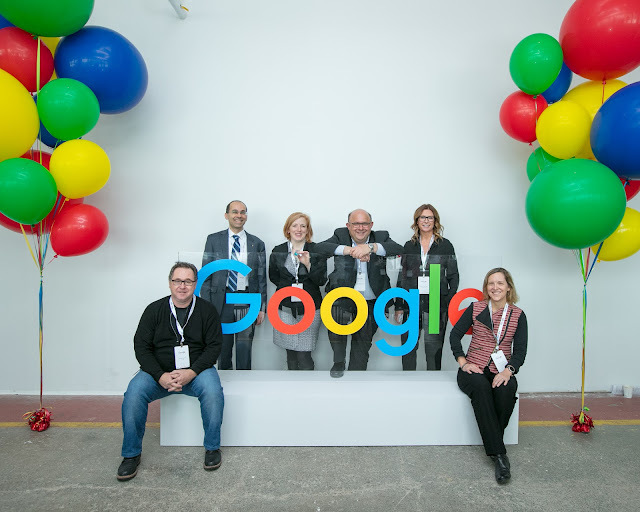 Every day, millions of Canadians turn to Google to kick-off their job search. 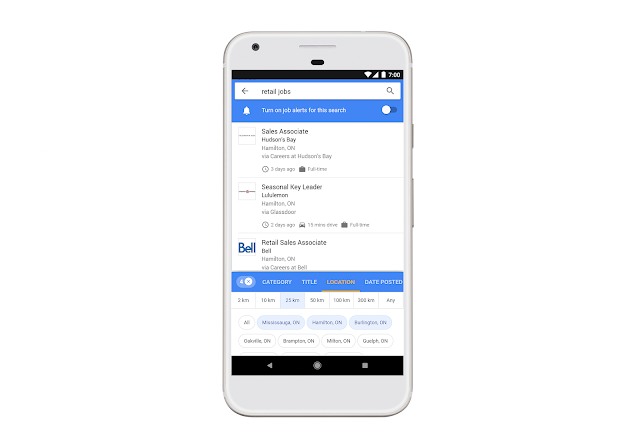 Now, this journey is simpler with the new job search feature on Google in Canada. Every year, on April 22, people around the world celebrate Earth Day in support of the environment. What better time to launch new Google Street View imagery, featuring some of Parks Canada’s most awe-inspiring places. As a result of the long-term collaboration between two iconic organizations - Google and Parks Canada, virtual visitors can explore mountain-top vistas, meandering ocean-side trails, and UNESCO World Heritage sites. Our national parks represent the best that Canada has to offer and are gateways to nature. This new Google Street View imagery introduces you to some of the incredible wonders of Canada’s vast network of protected wilderness and encourages you to discover more. It may even inspire you to visit. I can promise you incredible memories that will last a lifetime if you do. 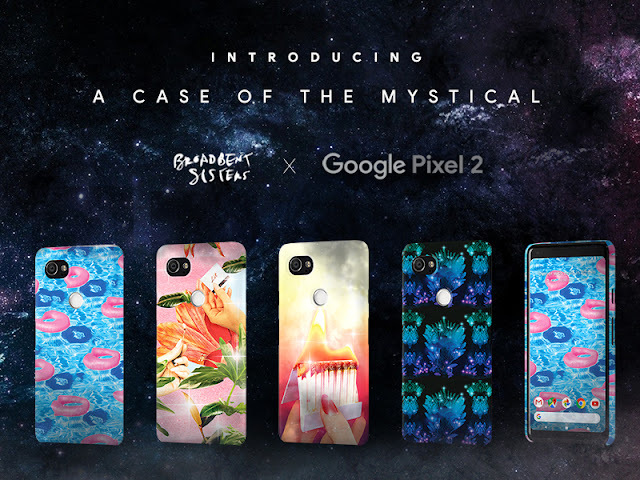 The new Google Street View imagery is also a reminder that we have a collective responsibility to protect the natural world. As we continue to see the impacts of climate change on our land and water, the need to protect them only increases. Allowing more people to see these treasured places will help build appreciation for them and future stewards to help protect them. 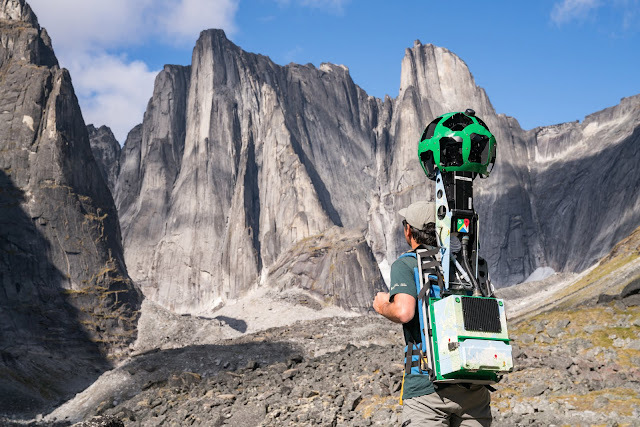 This latest Google Street View release includes stunning images of Nahanni National Park Reserve (Nahʔą Dehé, Northwest Territories). The park touches the Boreal Cordillera Ecozone, is globally renowned for its geological landforms, and its natural heritage is internationally recognized by UNESCO. Virtual visitors anywhere can experience Virginia Falls, also known by the Dene name, Náįlįcho. They can also explore the amazing Rabbitkettle (Gahnîhthah) mineral springs and tufa mound, and rock climbing mecca, the Cirque of the Unclimbables. Enjoy the rugged backcountry, mountain climbs, and a hot spring of one of our newest (and least-visited) national parks - Nááts'ı̨hch'oh National Park Reserve (Northwest Territories) that have been captured on Google Street View. The park is named after Nááts'ı̨hch'oh the mountain, which is a powerful place for the people of Sahtu, and is located in the traditional lands of Shúhtaot'ine (Mountain Dene). The imagery captured of the park will include highlights of Hamlet of Tulita, a fly-in access only community that is the main base of operations for Nááts'ı̨hch'oh. 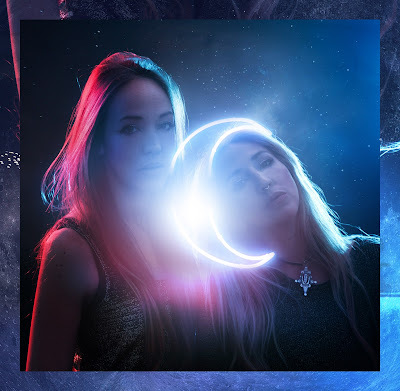 Wonders from Banff National Park (Alberta), Pacific Rim National Park Reserve (British Columbia), Terra Nova National Park (Newfoundland), and Glacier and Mount Revelstoke national parks (British Columbia) have also been published as part of this release for you to explore and experience virtually. Parks Canada preserves the sensitive ecosystems of our national parks, while providing Canadians with unparalleled opportunities to connect with nature. And Parks Canada works with Indigenous peoples to protect these treasured places and shares their stories with the world. I hope that experiencing this new Google Street View imagery will provide a better appreciation and understanding of the importance of our national parks. I encourage you to take the journey with Parks Canada and Google to learn about Canada’s natural, cultural and Indigenous heritage, and start dreaming about your next trip.